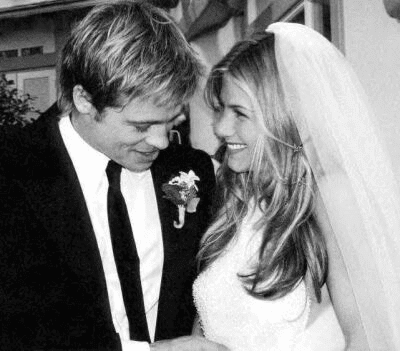 Brad Pitt and Jennifer Aniston used to be married. Then a shocking divorce in 2005 led to(or Was caused by) Brangelina. Unfortunately that relationship also deteriorated into a devastating split, which caused their five kids to be stuck in the middle of a highly publicized and messy divorce proceedings. As it stands, Brad,Angelina and Jen are officially single. And fans can't help but play social media match makers with the hope that some of the former spouses will attempt to rekindle their relationship. And ever since Aniston split from Husband Justin Theroux, the buzz around a Brad and Jen reunion has been growing. Reports are sketchy at the moment, but it appears the two former lovebirds are in constant contact these days, following Aniston's split from Justin. Now reports have emerged that her best pal and former Friends Co-star, Courteney Cox is allegedly unhappy with recent reports that the pair are slowly rekindling their relationship. First of all, their marriage didn’t end well 12 years ago. And people who are familiar with how it happened, believed their split was final.However, recent reports revealed that the former A list couple are slowly working on getting back together again. Not wanting to see her friend hurt in her vulnerable moment, the actress’ close friend Courteney Cox isn't having it. At least she is certainly not happy about their growing closeness. A new report claims she has spoken out to Jen. The Friends star is urging Jennifer to leave Brad in the past, and move on. Courtney feels it's a really bad Idea for Jen to be hanging out with her famous ex. Courteney who was with Jen through Brad and Justin knows exactly how painful things can get. An insider revealed that Courteney has helped Jen through relationship issues over the years and she still feels very protective of her friend. She wants to help Jennifer get back on her feet after her recent breakup. But she feels that reuniting with Pitt is not a good place to start. Although the source noted that Courtney is not totally against Jen being friends with the 54-year-old World War Z star again, she doesn’t want her to cross the line. But she is worried that in her present state Aniston's judgement cannot be relied on. Although an earlier report by 'People' stated that the former couple getting back together was “highly unlikely.” These rekindling romance speculations have a way of becoming reality. Brad Pitt and Jennifer Aniston have yet to address these rumors. Goodness knows it's a really complex situation as it is with Angelina and Brad not officially divorced yet, and their five kids may have a strong influence on what the two decide to do with their failed relationship eventually.